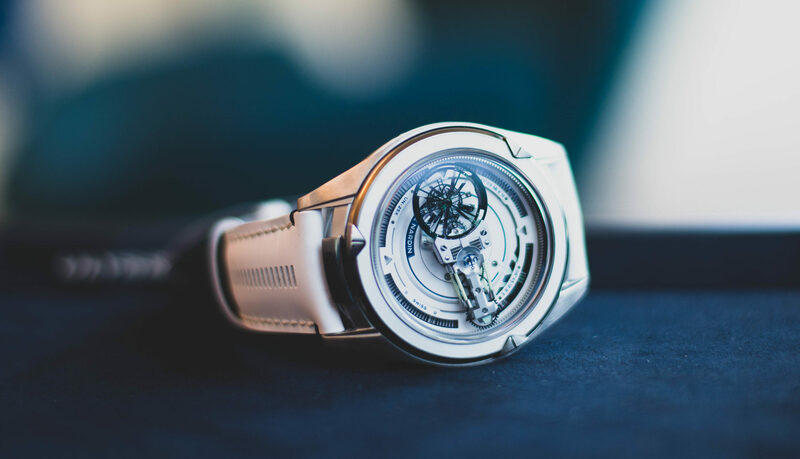 In the center of the small town of Glashütte, which has been a center of watchmaking since 1845, there is a museum –the “German Watch Museum Glashütte” –which contains treasures out of all proportion to the size of the city that is its home. The building was opened in 1881, in order to house a watchmaking school, and today, it is both the home of the museum, and of the Glashütte Original Alfred Helwig School of Watchmaking. The museum pulls no punches and hits you with one of its most spectacular treasures the moment you walk in. 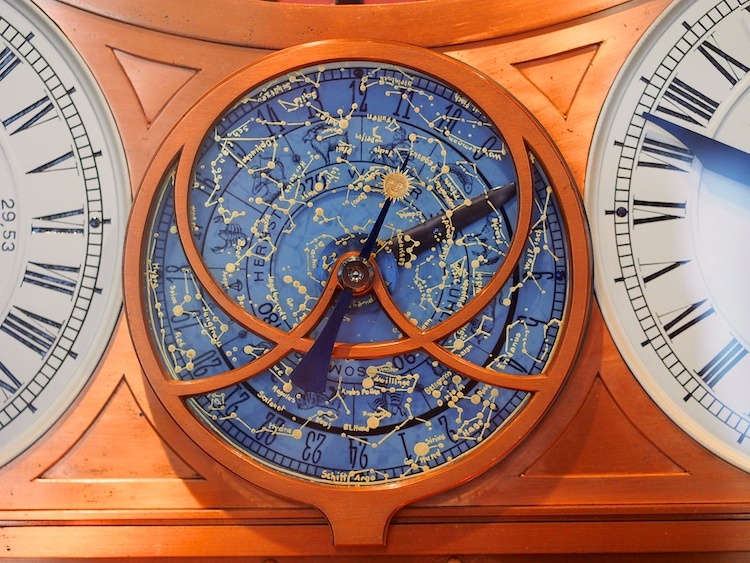 This is the Hermann Goertz Astronomical Art Clock, which took over 30 years to complete. Hermann Goertz (1862-1944), its creator, led a varied and sometimes hazardous life, which might have given him an especial taste for anything that smacked of reliability and permanence, and his clock is one of the last great reminders of the vision of God as the Grand Geometer, and of the Clockwork Universe as one in which constants like Time and Gravity were universal, unvarying, and manifestations of divine order. Goertz lost his parents at the age of nine, and was forced to move to the home of Mennonite relatives in the Ukraine. In the fullness of time he grew to manhood, as they say, and in the natural course of things, got interested in a local girl. As it happens, she was the daughter of a watchmaker, and he completed an apprenticeship in Odessa, taking over his father in law’s business. 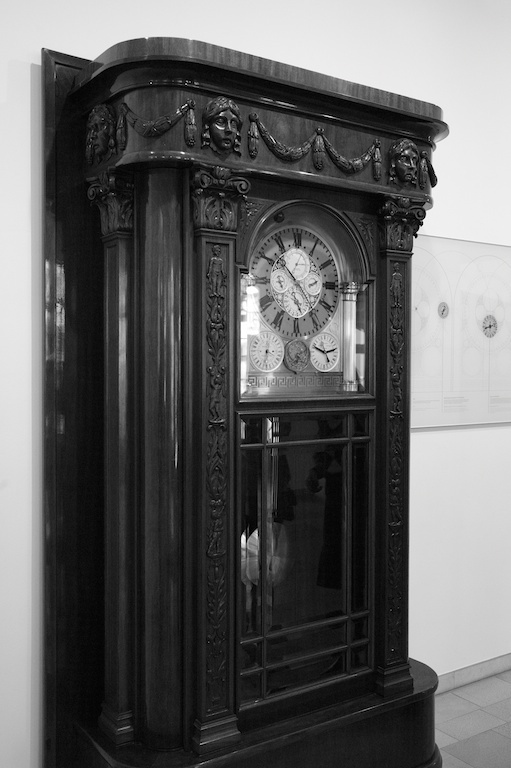 Eventually he and his wife settled in Kharkov, and it was here that he began the design of his Art Clock, in 1891. Forced to flee the Russian Revolution, he was able to bring only a few possessions with him –one of which was the upper part of his magnum opus. Sadly, his wife and family didn’t come with him –his wife refused to leave the Rodina. Goetz worked for A. Lange & Söhne for five years, but eventually returned to the school as an instructor in 1928. He was disabled by a stroke in 1937, and his friend Alfred Helwig helped him carry out further modifications on his Art Clock. 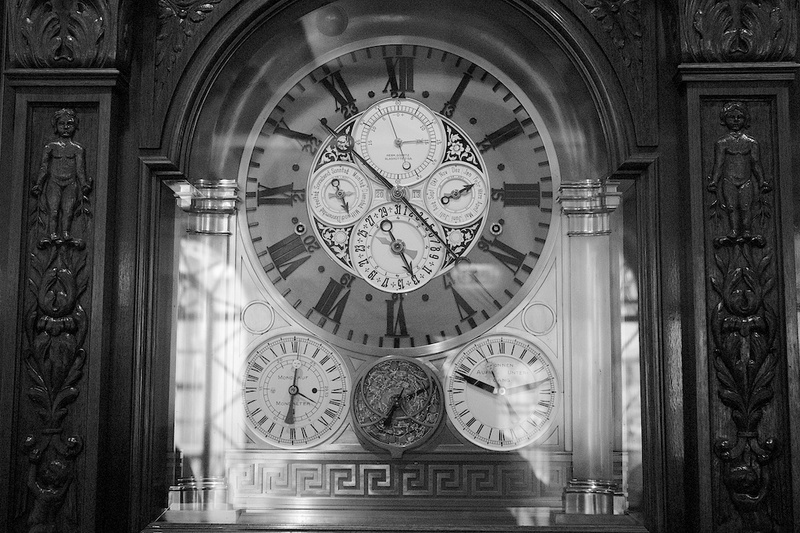 The clock itself had been completed over a decade earlier, however, in 1925, and three years later the State of Saxony bought it for 15,000 Reichsmark, and presented it to the school, as a gift, in 1929. 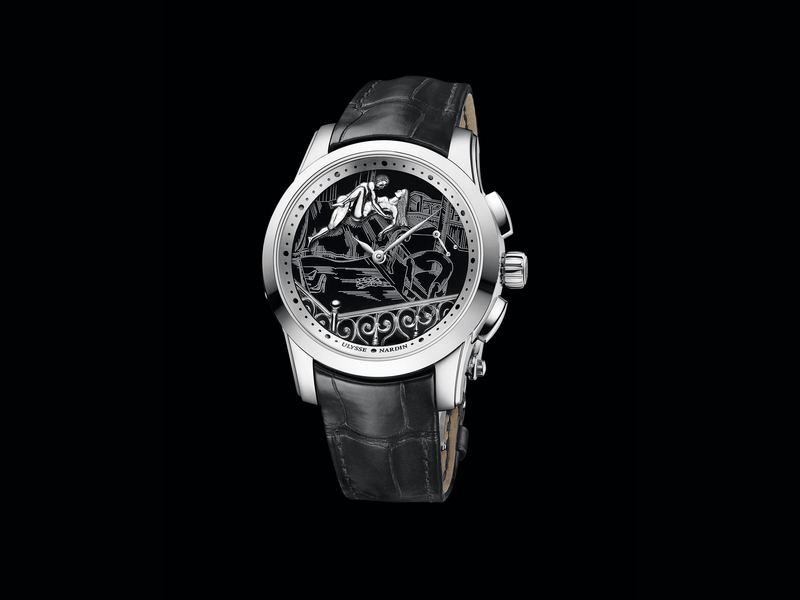 The clock is weight-driven, with a 32 day power reserve. Its striking works strike the quarter hours and hours. 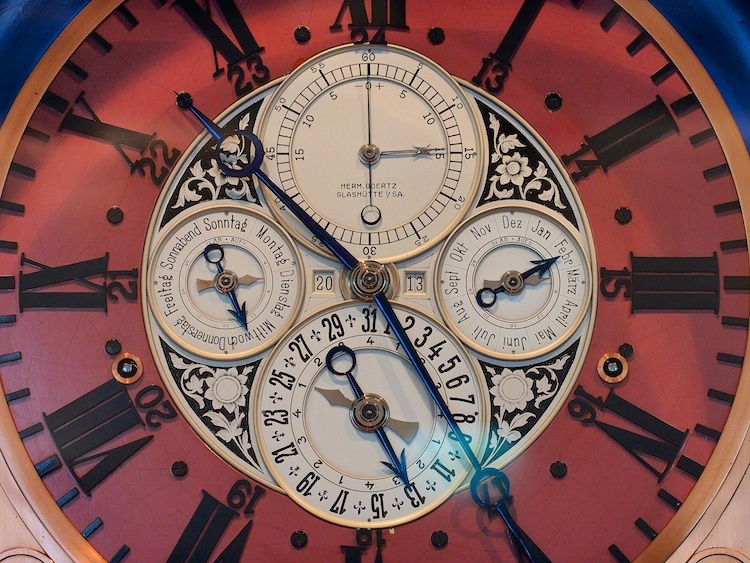 It is a perpetual calendar, accurate to the year 2899, with a digital display of the year. A large dial at the top of the display shows the Equation of Time (the difference between mean local time and true solar time) as well as the running seconds. 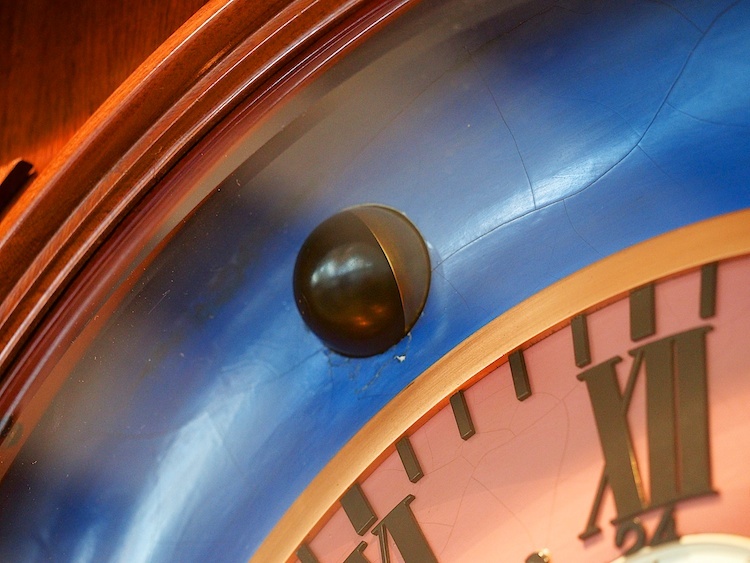 Goertz had originally wanted a spherical moonphase, but this was not added until Alfred Helwig installed one, in 1956. 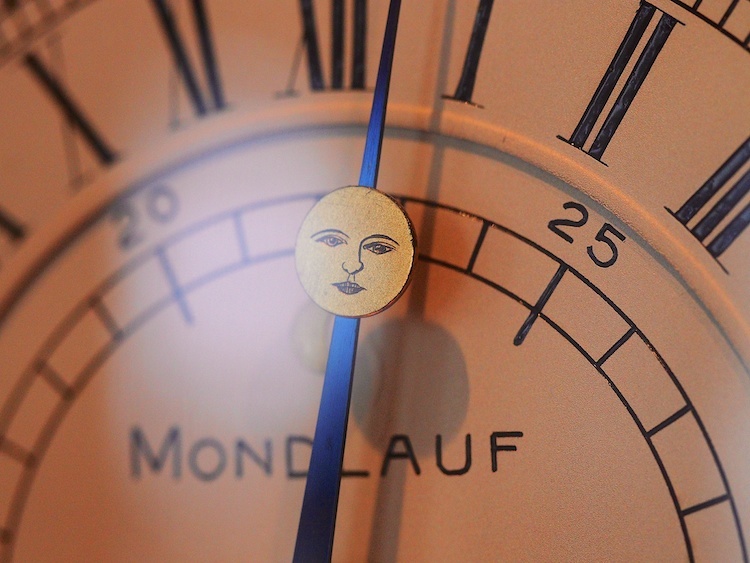 The lunar dial shows the age of the moon, with the longer hand showing the position of the moon as seen from Earth. 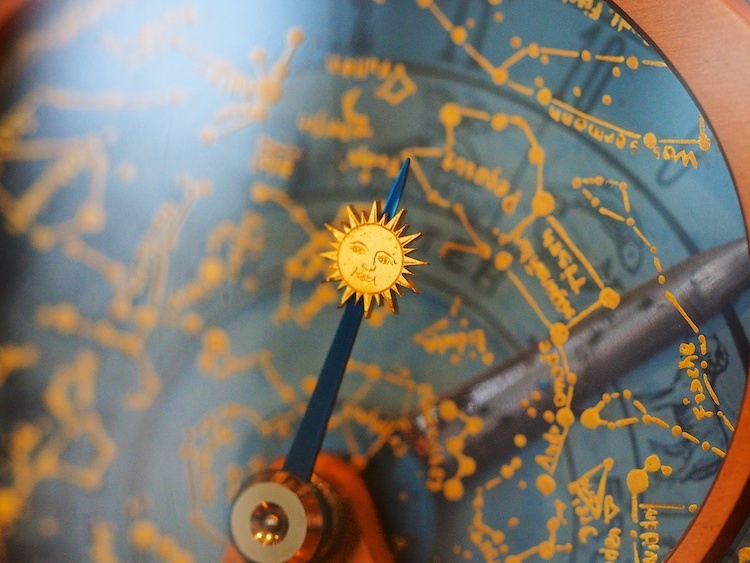 The solar dial has a sun hand that rotates once every 24 hours, and has two indicators for sunrise and sunset. 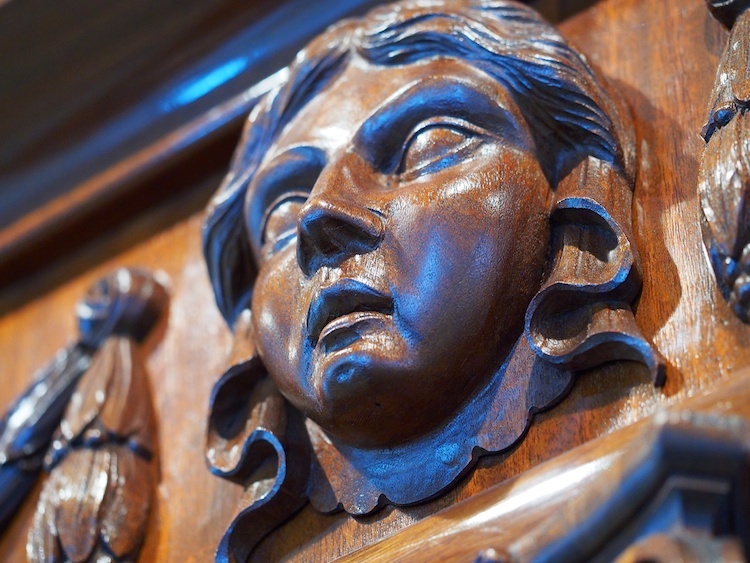 The case was designed by Goertz and made by the firm of Arthur Guricke, with the actual work being done by Bruno Reichel (1881-1958) in mahogany veneer or solid mahogany. This, mind you, is just what you see in the lobby. 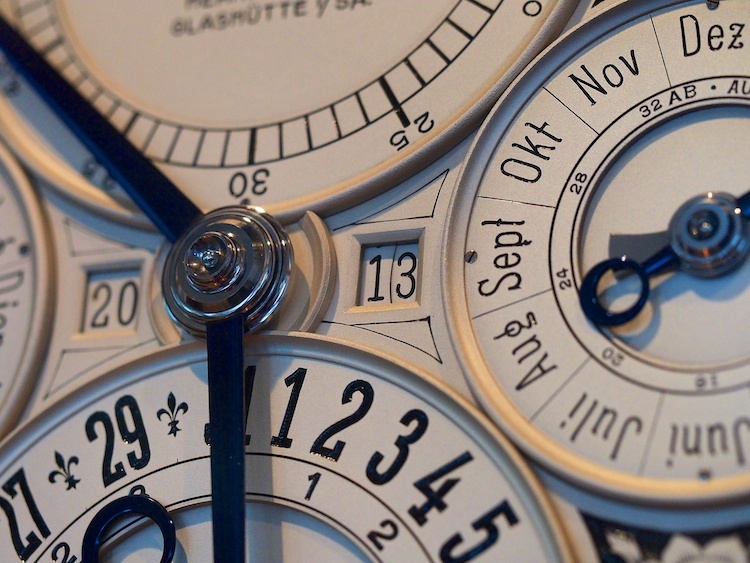 If you’re visiting Glashütte, my advice is to try if possible to plan on an entire day at the museum. The city now houses over a dozen different firms (including, of course, Glashütte Original, to whom I owe thanks for the chance to spend so much time at the museum) and is today, as it was at the beginning of the 20th century, once again one of the great European centers of mechanical watch and clock-making.